I've been writing for far too long to think about - but never all that proliferatively. Most recently Read Raw Press published Kittens in RAW TERROR (edited by Ian Hunter); and Welcome to the Hotel Marianas made it into THE BITTER END: TALES OF NAUTICAL TERROR (edited by Jessy Marie Roberts) from Pill Hill Press. A new Damian Paladin tale, Sailors of the Skies, appeared in DARK HORIZONS 55 (edited by Stephen Theaker) last year. I've also been helping Cubicle 7 with a supplement to their STARBLAZER ADVENTURES RPG entitled Legends of Anglerre, based on several Sword & Sorcery issues I wrote for the late STARBLAZER comic from DC Thomson. 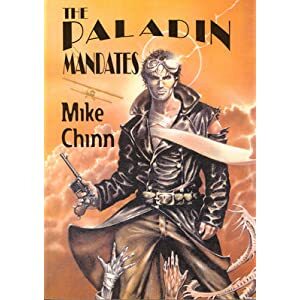 Once, I even garnered two nominations for the British Fantasy Awards, both for THE PALADIN MANDATES from The Alchemy Press. And they'll never forgive me if I don't mention The Alchemy Writers Group, of which I've been a member since it began. And peeps? You need to go read Welcome to the Hotel Marianas, as it is ace! Possibly the very shy and retiring author in question should mention his recent blog post which talks about it here! Hello, Mike, are you going to the World Horror Convention? I should ask that on your page, hang on, I will and just have! Hey - I've made the long-list! Twice, too! Proud to announce that my short story "A Matter of Degree" has been accepted for the final Nemonymous (Null Immortalis). And if anyone wants to read a piece of Mike's fiction, his story 'Parlour Games' (first appearing in Tales from the Smoking Room) is reprinted on the Alchemy Writers site! ^there seem to be loads of Appalachian anthologies on the go at the minute.